A personalized letter from Santa! 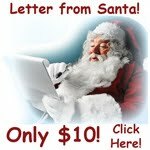 Visit EspeciallyFromSanta.com to order Christmas letters for the kids (and kids-at-heart) in your life. Letters also come with a "nice list" doorknob hanger and Christmas activity/coloring pages. <-- You can also click on this ad located on my right sidebar (through mid-December) so they know 3 Moms In 1 sent you.